If you have a problem inside your knee then I may wish to look inside with a camera. There are many reasons to do this and include diagnosing loose bodies, arthritis and cartilage/meniscal damage/tears. 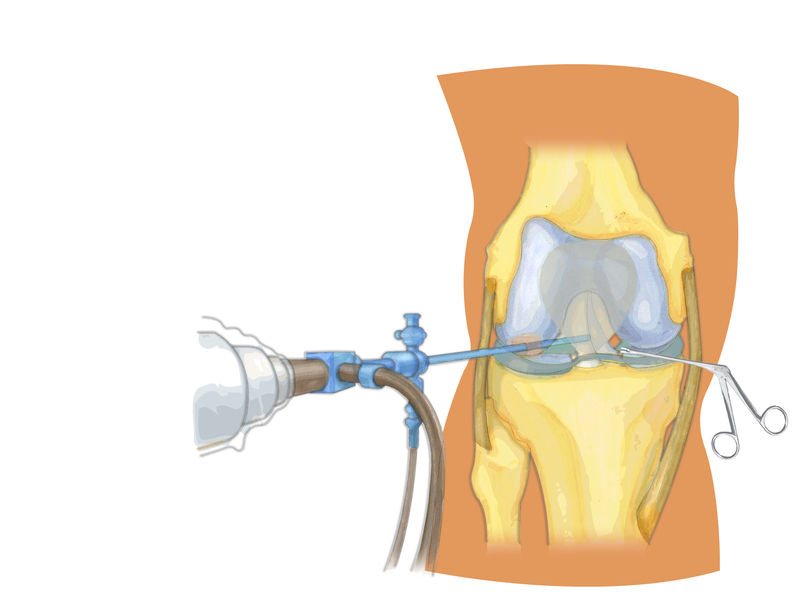 There are an increasing number of treatments used with the arthroscope including trimming or repairing torn cartilage, removing loose bodies, removing inflamed lining of the joint and removing arthritic bone overgrowth. An arthroscopy it itself is a diagnostic procedure and whilst identifying problems, is not a treatment. An MRI scan can also show problems inside the knee joint and is occasionally used as an alternative investigation. Surgery is carried out as a day case procedure under regional or general anaesthetic. A simple look around takes about 15 minutes, but if other procedures need to be performed, it can take longer. Approximately 3 or 4 small 3mm incisions are made around the knee to allow the camera and instruments inside. Care is taken not to injure the nerves just under the skin. At the end of the operation a local anaesthetic solution (to reduce the post-operative pain) combined with adrenaline (to reduce bleeding and bruising around the incisions) is normally injected into the joint. The incisions are covered with a sterile dressing as they do not normally require any stitches. The knee is then wrapped in a soft compressive bandage to help to reduce any swelling and keep the knee comfortable. Most patients are able to return home on the same day as surgery. They can often be discharged several hours after surgery as long as they are sufficiently recovered from the anaesthetic, although some patients take longer to recover. Most patients are pain free when discharged. All patients will need someone to take them home and be with them on the night following surgery. The anaesthetic will wear off after approximately 6 hours. Simple analgesia (pain killers) usually controls the pain and should be started before the anaesthetic has worn off. The large bandage around the knee is normally removed 24-48 hours after surgery. The non-stick sterile dressings on the wound are replaced with clean waterproof dressings and a tubigrip to supply gentle compression to reduce post-operative swelling. The wounds should be kept clean and dry until the wound has sealed. Showering is fine and the waterproof dressings can be changed afterwards. Bathing is best avoided until the wounds are sealed, typically 4 to 5 days after surgery. In summary, whilst the wounds are wet - keep them dry and when the wounds are dry, you can get them wet. Patients should and try to minimize their activities as much as possible in the first few days following surgery. The leg should be rested and elevated as much as possible. Painkillers (supplied on discharge from hospital) and cold packs may be used as required. Simple exercises, including straight leg raises and other exercises as instructed by your physiotherapist prior to discharge should be performed. Most patients do not require formal physiotherapy following arthroscopy as all patients are seen and assessed by a physiotherapist prior to discharge from hospital. Some patients might require physiotherapy either before or after the first post-operative check-up. Recovery is a gradual process and whilst most patients bounce back quickly following arthroscopy everyone should assume it will take up to 6 weeks to make a full recovery and symptoms can often improve for some time beyond this period. The speed of recovery depends on the surgery performed, the degree of degeneration found and the age of the patient. In general, the older the patient and the more degeneration a patient has, the slower and less predictable recovery will be. Most patients can perform most tasks around the house and return to driving within a few days. Sedentary/office workers can often return to work a few days after surgery. Patients performing more physical work might require two to 6 weeks off work depending on their individual positions. Patients can usually return to sport between 3 to 6 weeks following surgery. The small wounds can remain tender for a few months following surgery. Occasionally patients are advised to be non-weightbearing for a period of up to six weeks, most commonly if a microfracture chondroplasty has to be performed. The leg needs to have full control of the pedals. You are advised to avoid driving until you regain full use of your leg. An Arthroscopy is an extremely safe routine operation with a very low complication rate. Overall over 97% are happy with the result. However complications can occur. Potential complications include infection, injury to blood vessels and nerves and severe pain and swelling in addition to the rare general complications such as blood clots (DVT) and anaesthetic risks. In general, the risk of sustaining a complication as a consequence of the operation that leaves you worse off in the long term is less than 1%. The biggest practical risk is the risk of not being able to improve symptoms as much as desired or at all. This occurs most commonly due to the presence of degenerative changes. Most ongoing symptoms following arthroscopic surgery are usually the result of the underlying problem within the knee.